The most memorable season in the brief history of the IronPigs came to a halt on Friday night, as the Columbus Clippers won 4-1 on Friday night and took the series three games to one. The Columbus Clippers, who won their second straight Governors' Cup on Friday night, got off to an early start as they plated two runs in the second inning on an RBI single by Juan Diaz, and an RBI double by Paul Phillips to get the Clippers on the board against Edell. Edell would allow no further damage as he gutted his way through five innings of work. Meanwhile, the IronPigs struggled at the plate once again as RHP Paolo Espino went seven strong innings and allowed just one run on four hits. The one run was a solo home run by Brandon Moss, who tallied four long balls in the postseason. Phillippe Aumont game in for two solid innings in which he allowed one hit and no runs with one walk and four consecutive strikeouts. 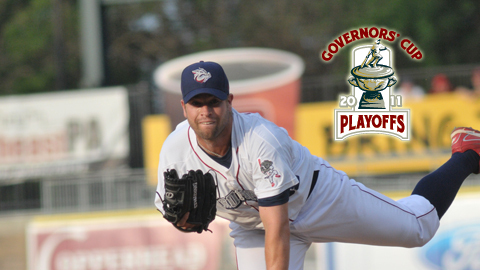 Joe Savery also came in for a final inning of work with the IronPigs, and allowed one hit and one walk. Justin De Fratus would work the ninth and allow two hits, a walk, and a run on a wild pitch. Despite the heartbreak of a season ending, there was a lot to be happy about after the game that gave some perspective as to what the minors are all about. Shortly after the loss, manager Ryne Sandberg announced that Domonic Brown, Joe Savery, Erik Kratz, Justin De Fratus, and Brandon Moss would all be going up to the Phillies. Joining them will be Sandberg himself, who will don a Phillies uniform for the first time in 30 years. Savery and De Fratus will be on a big league roster for the first time ever, and will be jumping right into a situation in which they are assured to be playoff-bound with the Phillies, who clinched earlier this week. For Sandberg, it could be a return to a big league uniform for good, and his first time with a major league team since 1997 when he spent his last season with the Chicago Cubs. For now, IronPigs fans will look forward to next spring and the crop of players that will next don the blue and red in hopes of becoming the next major league talents to pass through Coca-Cola Park.